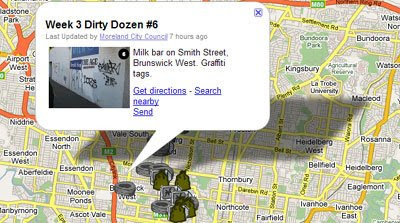 Moreland Council, in the north of Melbourne, Australia has produced a great Google My Map to find, and clean up, the twelve dirtiest spots in Moreland. "Grot Spots" can be added to the map both by local residents and by council workers, so is a great way for the council to interact with and act on the concerns of local residents. A new "Dirty Dozen" of the worst spots is published every two weeks. The map has "before" and "after" photos, customised icons and sometimes some colourful quotes by staff or residents about the particular 'grot spot'. The map is part of a campaign by Moreland City Council to clean up the city, stop illegal dumping, bust the myths on dumping and to let people know how to get rid of rubbish properly.